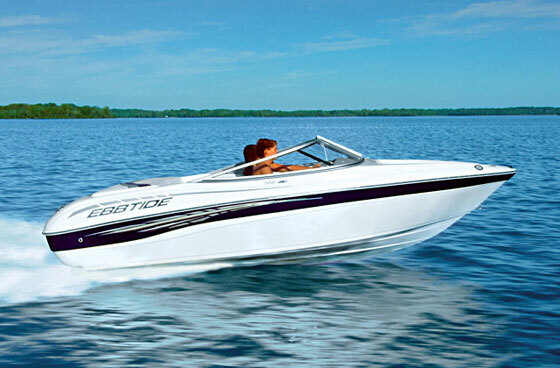 The new Ebbtide 176 SE Bowrider is an affordable way to get high quality in a small runabout. The newest model in the Ebbtide line-up, the Ebbtide 176 SE Bowrider, is the perfect runabout to perk the interest of anyone who wants to get into boating. 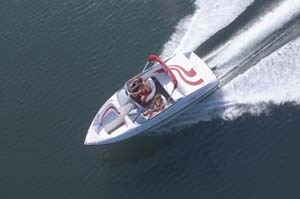 It’s a tight little package, with build quality the company has learned over decades of manufacturing boats. It’s not the only way to get into boating, but it’s the right way in. Why? 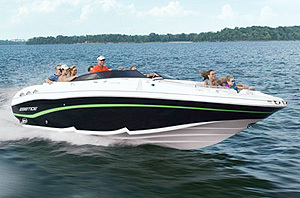 The Ebbtide 176 SE bowrider is a perfect example of an entry-level bowrider, built with quality. The story usually goes something like this: someone wants to get into boating to make the most of his or her leisure time and have something everyone in the family will enjoy. So they go out and buy an entry level boat or something on the used market. The boat falls short of expectations, so they sell it, then go out and buy a camper or some other recreational vehicle. They’re gone from boating for good. That’s not good for the marine industry. 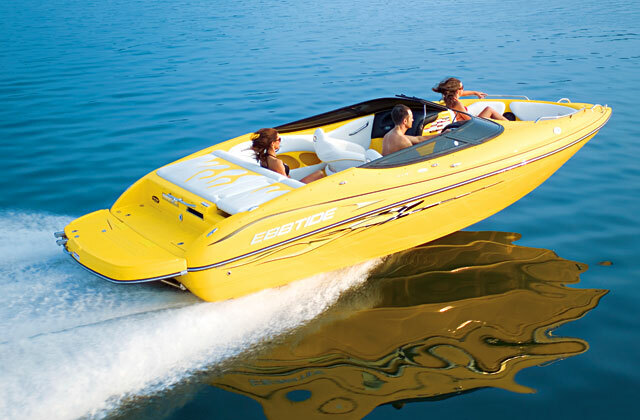 However, it turns out what’s good for the marine industry also is good for the new boater—and for good reason. 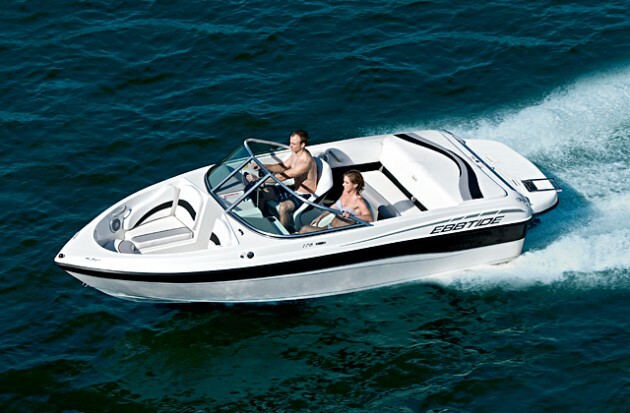 If that new boater gets into something that’s affordable and meets or exceeds his or her expectations, they’re likely to stay in boating. It’s good for the industry, for obvious reasons, and it’s good for the boater because they get real value for the money. 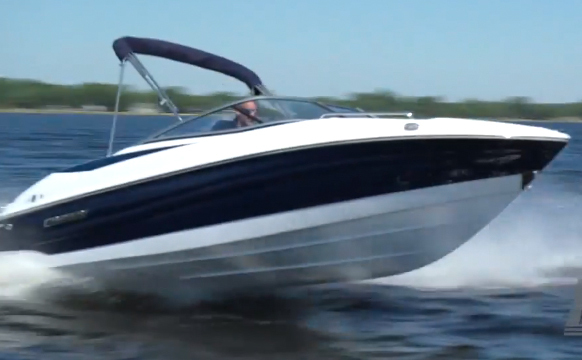 That’s why quality is important, and why the Ebbtide 176 SE Bow Rider is a win-win proposition for entry-level boaters. For starters, it’s affordable. Base MSRP with a 3.0-liter MPI four-cylinder MerCruiser stern drive engine is $26,860. For a splash of color on the hull sides, opt for the upper hull band, which is just $280. It weighs 2,300 pounds so you can tow it with nearly anything, and the 135-horsepower engine provides ample grunt to make it entertaining to drive. The 176 has such niceties as bow and stern pull-up cleats and a ski tow eye at the rear. It also comes standard with a generous swim platform, which is something you don’t always get on an entry level model, let alone one with a telescoping three-step boarding ladder. The wide swim platform found on the Ebbtide 176 SE is a must-have item, which some other builders would charge extra for. Inside the cockpit, the 176 is equipped as you would expect from an entry level product. The layout is simple, with a rear bench with stowage underneath and two swiveling bucket seats that adjust fore and aft. It also comes with a couple of items you might not expect from a price-point model, such as carpeting and angled footrests for driver and front-seat passenger. 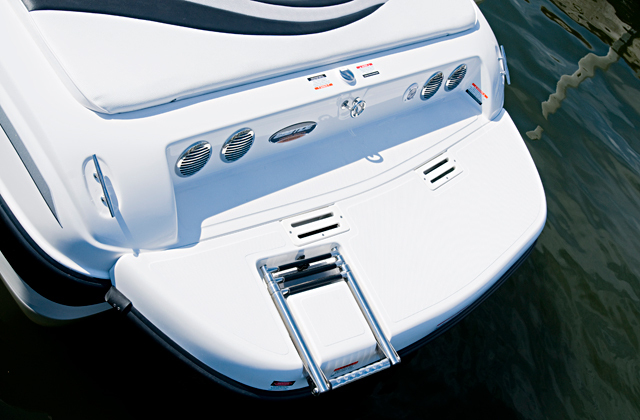 Up front, the bow compartment is molded as part of the deck, in positive-molded gelcoat with stowage and a self-draining cooler, cupholders, and two of the stereo system’s four speakers. That’s about it for what you can see. What you can’t see is how Ebbtide puts its boats together. Laminated by hand, the Dyna-Plane hull uses balsa core and Divinycell reinforcement. Ebbtide uses fully-encapsulated marine grade plywood for its stringer systems, and does so proudly because wood has certain characteristics that synthetic materials do not. For example, wood absorbs shock and vibration better, so it doesn’t transfer that harshness to its passengers, which makes for a quieter, more comfortable ride. Ebbtide backs it up with a limited lifetime warranty on the transom and stringer system, too. If someone new to boating asks the right people — or reads the right boat reviews on boats.com — and gets into the hobby with the right equipment, odds are he’ll enjoy himself more and become a boater for life. That’s a win-win for everyone. 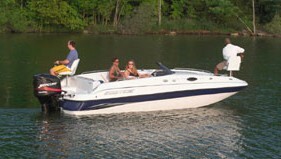 Other Choices: The Bayliner 175 is a boat in this class with a long history, and is the beginner bowrider often used as the standard to measure others by. Another option is the Tahoe Q7i, which can be purchased with an optional wakeboard tower. 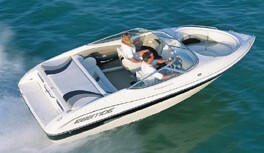 For more information, visit Ebbtide, or read Six Super Starter Boats for the Beginner Boater.